The Canadian Intellectual Property Office fonds is one of the first places to look if you’re trying to get an idea of what LAC holds in terms of patents. You’ll find relevant holdings in the Patent Branch and the Industrial Design Division series within that fonds. Both series encompass the pre- and post-Confederation periods and include documentation that demonstrates the various stages of the patent application process. Please note that many of these are searchable through the Canadian Patents, 1869–1919 database. 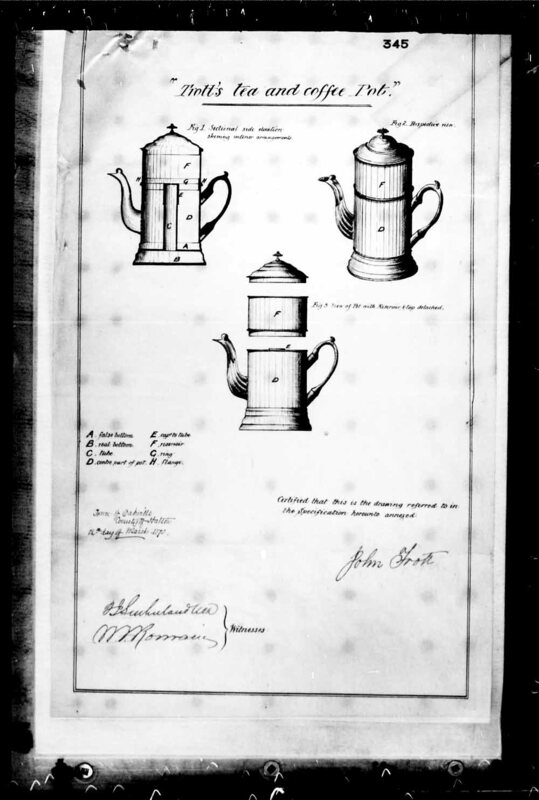 For example, here is a patent for improvements to a tea and coffee pot. You’ll notice that the document includes detailed technical illustrations (Figures 1 to 3) as well as the name of the inventor and the signatures of witnesses. The Water Motor Patent Application series of the Antoine de Lotbinière and François Hallé fonds (MG55/29 No. 168). If you’re not sure where to start looking, you can always try the private fonds of an individual inventor (usually denoted by MG) or look within specific government fonds, such as those described above (usually denoted by RG). If you have a suggestion of what patent applications to focus on in our next blog post, please let us know! This entry was posted in Consultation and Reference Services, Our Collection and Facilities and tagged CIPO, patents, patents of invention by Library and Archives Canada Blog. Bookmark the permalink.